Have you had a chance to stop by the Central Minnesota Federal Credit Union since they came to town this past March? Did you know that if you live in the "Land Of ROCORI", you can be a member of the Central Mn Federal Credit Union? The Holiday Season is a great time to visit their festively decorated new office located just a few doors down from the Bagel & Brew in Cold Spring. Sheila, Lynn, Peggy, Norma, Bob & Ryan are all looking forward to meeting you. They can provide a wide range of personal and business financial services ranging from checking accounts to business loans. The new Quarry Theatre in Cold Spring, owned by Tom Griffin, was financed by the Central Mn Federal Credit Union. "Members working together" is the philosophy that has guided Central Minnesota Federal Credit Union since 1939. The charter members decided they could do better financially by pooling their resources and lending them to one another in a unique, not-for-profit operation. Today, that philosophy is more important than ever. Central Minnesota Federal Credit Union is providing more member services and growing stronger every day. 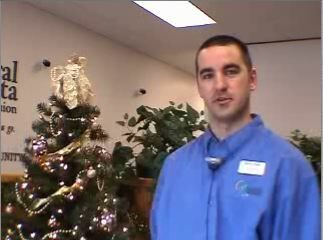 < Meet Bob, branch manager in Cold Spring. On January 30, 1939, under the direction of Louis Kunkel, the Melrose Catholic Parish Credit Union was organized to provide low-cost loans to people in St. Boniface and St. Patrick parishes, along with the employees of the credit union who could not obtain loans elsewhere. In 1964, Louis Kunkel retired and Robert Cassidy became manager for three years. Then, in 1967, George O'Brien took the position of manager. On January 29, 1969, the membership was expanded to add the surrounding small catholic parishes. Also included were the spouses and blood relatives of those parishioners in St. Mary's parish. The name was changed to Melrose Catholic Deanery Credit Union. On July 26, 1971, the bylaws were amended to reflect the legislative changes of 1971 and added; "once a member, you are always eligible to be a member". On February 28, 1974, it was adopted that relatives of qualified members may also become members. On June 10, 1974, the field of membership was limited to persons (excluding members of the Rural Catholic Parishes Credit Union, St. Martin, Minnesota) working or residing within the boundary lines of Melrose Independent School District #740. The name was changed to "Melrose Credit Union". George O'Brien retired as manager in 1978 and Simon Hellermann, filled his position. < This is Sheila, member service supervisor in Cold Spring. On February 24, 1981, the field of membership was expanded to the people working or residing within the boundary lines of Albany Independent School District #745 and the employees of the credit union (excluding members of the Collegeville Community Credit Union, Collegeville, Minnesota). The Albany Office opened in October 1981. On February 16, 1985, the field of membership was expanded to include the merged Rural Catholic Credit Union, St. Martin, Minnesota, and anyone working or residing within the boundary lines of Grey Eagle Independent School District #791, including the community of Grey Eagle, Minnesota. On February 15, 1987, the field of membership was expanded to include anyone working or residing within the boundary lines of Paynesville Independent School District #741, including the community of Paynesville, Minnesota. In October of 1989, the Grey Eagle Office opened. In 1993 two new branch offices were opened, the Freeport Office on May 3 and the Paynesville Office on June 14. All of these offices were opened to make services more convenient for the members. On June 15, 2001 the Melrose Credit Union became a federally chartered credit union and the name was officially changed to better reflect the membership to "Central Minnesota Federal Credit Union", as it is today. At this time the field of membership was expanded to include anyone working or residing in approximately the western 2/3 of Stearns County and all of Todd County. On August 28, 2001, Simon Hellermann retired, as CEO and Richard Odenthal became the new CEO. 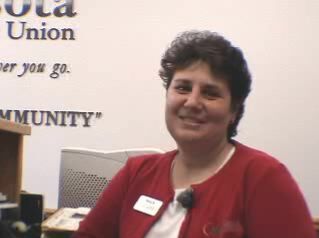 On March 15, 2003, the field of membership was expanded to include anyone working or residing in the Willmar area and part of Otter Tail, Wadena, Cass and Morrison Counties. 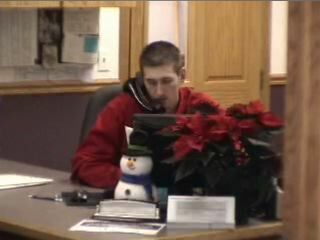 In June 2003, the Sauk Centre Office was opened to make serving the new expanded area more convenient for the members. < Ryan can help you with all types of personal and business loans. On November 24, 2003, the field of membership was expanded to include persons who live, work, worship, or attend school in and businesses and other legal entities located in Stearns County, Sherburne County, or Benton County, Minnesota. On June 7, 2004, a new branch office opened in St. Joseph, Minnesota to make serving the new expanded area more convenient for the members. On March 14, 2005 a new branch office opened in Cold Spring, Minnesota and on August 15, 2005 a new branch office opened in Long Prairie, Minnesota. They seem like some really nice poeple and a great business.